Recently, the New York Times released a mostly positive article on floating… But the opening line mentions that the tank smelled “like a used gym sock.” Today’s guest post from Sandra Calm (co-owner of the Float Shoppe, my wife, who also happens to have a masters in nursing) walks us through why that darn smell appears, how to get rid of it, and, most importantly, how to prevent it from every rearing its ugly head in the first place! No float center ever has to have a tank that smells like a used gym sock! Here’s an overview of the problem and easy steps to prevent or cure it. Body oils, product residue, and skin cells are shed by each person who enters the float tank. Without getting too technical, these things contribute to the development of the characteristic locker room smell. 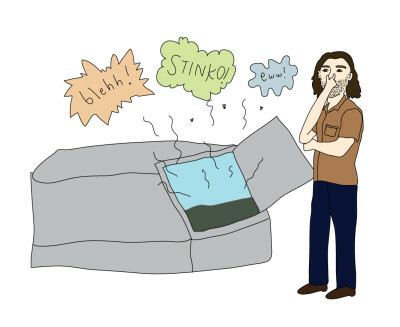 Regular float tank maintenance procedures keep this problem away entirely. Here’s what you need to do! Whether you use hydrogen peroxide or another sanitizer, be sure you are keeping your levels consistently within the correct range. If you are using hydrogen peroxide, this means between 60 and 100 ppm. Do not ever allow your sanitizer to reach a reading of zero. Test several times each day, and document your levels and additions each time. We test before opening and after closing, adding hydrogen peroxide as necessary. Change filters regularly according to the volume of people using your float tanks. We have found a filter change every 30 to 40 float sessions works very well, which equates to once or twice per week for us. If you’re unsure, change your filters more often than you think you should. Depending on your model of float tank, you may be using either disposable or reusable filters. If you are using disposable filters, that’s easy! Just replace them. Reusable filters, on the other hand, must be soaked overnight in bleach water solution then sprayed with a power sprayer and allowed to dry between uses. It works well to have at least two filters per float tank so you can switch one out for the other, allowing one to be cared for while the other is in use. Bacteria and fungi love places that are warm and moist, just like the walls on the inside of a float tank. At least twice or three times per week, wipe down all interior surfaces of the float tank with a disinfecting solution such as bleach and water, ahydrogen peroxide spray, or medical-grade cleaner like Virex II. This will prevent the growth of any mildew or other things on the inside of the float tank. If your float tank develops condensation, dry off the interior surface every morning with a towel or a mop with an absorbent surface. Float tanks are incredibly inhospitable to microorganisms because the water is so dense with Epsom salt. At the correct density, water inside the cells of microorganisms is sucked out of the cell, essentially causing the cell to implode. Purchase a hydrometer, which measures the specific gravity of your water, and check the specific gravity of your float tanks at least twice per week. Make sure your water is kept at a specific gravity between 1.25 and 1.29. Below 1.25, floats aren’t quite floaty enough…At 1.3, the solution is so close to saturation the salt will have a greater tendency to come out of solution and crystallize. Not only do correct salt levels ensure good floats, they also keep microorganisms at bay. While this topic requires an entirely separate post, the short story is: keep your pH and alkalinity balanced. Measure regularly. Generally, we have found that required adjustments can be made mostly with Epsom salt (which is mildly acidic) and sodium bicarbonate (baking soda, which, in short, helps the solution to stay balanced). Ensure your clients are taking a rinsing shower before each float, using soap to wash from head to toe. We recommend Dr. Bronner’s liquid soap, which you can cut with 25% water to reduce costs. Because skin oils are less dense than the water, they float on the surface of the water and can escape filtration unless they are mixed into the water.. Ensure your filtration system “roughs up” the top of the water to promote adequate mixing of the solution during filtration. If there is no disturbance to your water as it filters, perhaps you could direct the filtration exit port towards the surface of the water to create a disturbance in the surface. Otherwise, you will need to manually mix the solution while it is being filtered using, perhaps, a large pool skimmer wand. Leaving an oil absorbing sponge such as The Scumbug in your float tank overnight helps to absorb excess skin oils. If your float tank manufacturer approves it, they may also be placed within your filtration system. The latter technique assumes adequate mixing of the water, however. Most float tanks are outfitted with a skimmer, designed to remove any hair or other large particles from the surface of the water. Oils have a tendency to stick together, and since hair is naturally coated with oil, removing hairs will pull oils as well from the surface. Products like Spa Perfect are designed to break up oils, changing the way they behave in water and allowing them to be filtered out. Enzymes break down molecules. A flocculant causes small particles to group together into larger particles, allowing them to be filtered out. Anything on a client’s body will end up in the water. Encourage your clients not to use shampoo or conditioner before they float, but to rinse their hair well with water, using Dr. Bronner’s if they have a lot of product in their hair. Most shampoos and conditioners have constituents such as sodium laureth sulfate which will leave a residue in the water, so look for products that are sulfate-free in case the client decides to use shampoo or conditioner beforehand anyways. Nature’s Gate Shampoo and Conditioner are both wonderful, and we’ve found they work very well to remove salt after floating. As a sidenote: it’s generally substances from hair products that forms the ring at the waterline in float tanks, easily cleaned using a semi-rough sponge. Recording all figures related to your float tank is essential for your awareness of trends and needs of the float tanks over time. We use Helm, which has excellent internal recording capabilities, including the option to graph levels over time and compare levels to each other. For example, you can see hydrogen peroxide levels vs. hydrogen peroxide additions on the same graph together. If you keep having a problem with one tank, sometimes correlations can help you to see what’s happening. Follow these steps to bring your tank back up to snuff, then be sure to implement all aspects of the maintenance list, above. Filter all day during a maintenance day and for long times whenever possible. Change filters and filter some more. Double check to be sure all aspects of your filtration system are in proper working order. Add a relatively large dose of sanitizer during a maintenance day, ensuring sanitizer levels are within normal range before returning to normal business hours. Wipe down the inside of the float tank, paying close attention to every nook and cranny. Balance all levels, starting with water, then salt, then sanitizer, then alkalinity (which affects pH), then pH. Remember, everyone with a float tank has most likely faced this problem at some point or another. You can have clean, sparkling water all the time. If you’re struggling with your water, reach out to us and others in the industry. You are not alone, and we are all here to help! This article represents the best of our knowledge after running a commercial float center for four years. Additional ideas are welcome and will be added! Please email dylan@floatshoppe.com or comment below. We are forced to use bromine in our tanks. We keep smells at bay by using “micro doses” during the day and then at the end of every night we “shock” the tanks with a large dose and let the tanks pump while we finish cleaning the center every night. Minimum pump time 45min. Jeff, I’m curious what a micro dose means? Our protocol is kind of the opposite: adding bromine about once per week, and shocking it three times per day (before opening, 2pm, and after close). That always keeps the bromine levels between 2 and 4 ppm. If they ever drop to 1 – 2 ppm, that’s when we add bromine in 1-2 tbsp measures to bring it back up to 2 – 4. We’ve found the test strips very unreliable for bromine testing, and always use a liquid test with OTO. We have been operating for over 6 years & we use a ColorQ7 test kit – but it doesn’t seem to read Bromine levels unfortunately (which is what we are required to use here) so we still use test-strips – I’d love to know if someone has found an electronic test kit that does actually provide accurate Bromine readings for float tanks. I think the problem is that the reagent takes too long to dissolve into the super-saturated solution of a float tank. Thanks Tim – so you have used this photometer & found it reliable/accurate? Does it use a reagent & do you need to leave it in extra long or dilute your sample or anything like that? – we find the reagent for our current photometer doesn’t seem to react properly – perhaps due to the highly saturated water. Since we use H2O2, I’m really glad to see you all sharing information on bromine. I’m no expert there. Hanna instruments use a test strip that you waggle in the solution before you test it. It reacts very quickly in about a minute and seems to be very accurate. Thanks for this in-depth article and for the links to the shampoos you suggest, just yesterday some new clients of ours in Tulsa (yes, Tulsa again!) were asking about the best shampoos to use. I will send this article on to all new leads and invite them to follow your most informative blog. Thanks for being there for the Float World ! Good article – but it’s not just body and hair oils, shampoo residue, and skin cells – a big part is Urea which is a waste product of many living organisms (including bacteria), and is the major organic component of human urine and sweat. The smell is caused by bacteria which is also what causes gym socks to smell! The best soaps to use are organic / without SDS – sodium lauryl sulfate which binds with the sulfate in the tank solution and causes tide marks. I don’t believe H2O2 should be used on it’s own as you need to use it in conjunction with UV to make it effective. Thanks for your comments, Tim. Is there something we should all be doing to manage urea in the tanks? I’m obliged here in London to use Chlorine which seems to irradiate urea – I did try UV and Ozone and H202 but had issues with Urea build up – which was apparent with a test kit we had at that time – I believe the test looked Nitrogen levels… but it was a long time ago. What products do you use to clean the interior walls of your float tanks? We have cabins where the walls are seven feet high and are made of FRP board. We’ve been using our 35% H2o2 mixed with water to spray down the walls once a week. Curious to see what others are using. I believe both H2O2/water or Bleach/water work perfectly, but I would encourage multiple cleanings a week. Hi, Sandra! Thanks for the detailed notes. A couple questions about cleaning filters: we’ve been using a dishwasher detergent solution with a small amount of bleach added to soak our filters, on the theory that a detergent will help pull oils out of the filter cartridges. What do you use for your soaking solution: just bleach? What proportions? Also, we’ve soaked our cartridges for the whole week they’re not in use. Is letting them dry important? I would have assumed bacteria would just go dormant. I also still haven’t found a reliable way to get my pH in balance without causing alkalinity to shoot up. I’d love to hear a description of how you guys do it. Hi Colin – don’t you end up with soap foam in your tanks after using dishwasher detergent? Seems like you would. We just use a commercial filter cleaning products. It’s noxious AF (for our staff), but … does the job. If your PH is low, baking soda is the most natural way of bringing it up. Go easy with it, though; a little goes a long way. Try a half a teaspoon every couple days until it comes into the 7.2-7.6 range. If it’s too high, I’ve heard that soda ash is the most natural additive, but have not tried it. We’re using a commercial spa down product currently. That said … we really don’t have to adjust ph all that often. If everything is staying sanitized properly, ph should generally stay in check. If your ph levels are wild west, it points to there being something off with the sanitization protocol. We haven’t had any foaming from the dishwasher detergent – we rinse well before the filters are reinstalled, and anyway it’s pretty low foaming to begin with. Soda ash is also a pH increaser – if the internet is to be trusted, it’s pH 11.4. You need an acid to lower pH. Our trouble has been that everything we’ve tried to date to raise pH has caused total alkalinity to increase even more, and we end up alkalinity locked around pH 6.8 or so. This isn’t what people tell me is supposed to happen, to the point I’ve started wondering if the soda ash I bought does not actually contain what it says on the label. As I understand it, baking soda increases TA more than pH, so that’s not our answer. Colin, I see your rationale with using detergent with the filters, but we have not found that to be necessary as long as the filters are power-washed. It’s great that you don’t have suds…it must mean you rinse them very, very well! As far as drying goes, I have arguments in my mind in both directions, and I don’t know that soaking vs. drying is better. Tank chemistry is a whole extra post. Sodium bicarbonate (baking soda) does more stabilizing of pH than anything else, but it does have a mild effect in raising pH. I will try to get together a post for the future which explains this more thoroughly. FWIW, dishwasher detergent is actually quite difficult to produce foam with, even if you put it in a jar and shake it. When you say “power-washed”, do you really mean *power-washed*, not just the jet setting on a garden hose spray head? That’s a little more hard-core than we had considered. You do that every week, and it doesn’t damage your filter cartridges? You’ve mentioned in the article that “If you are using hydrogen peroxide, this means between 60 and 100 ppm.” but the Floatation Tanks Association standard is 1. Hydrogen Peroxide (in ppm) – Min-Max: 20-100, Ideal Range: 30-40. Hi, While Sandra wrote the article, my best answer is that this is a “rule of thumb”. I don’t believe anyone has a definitive research study that shows the right amount to put in the tank. If i’m wrong, please share here! Anecdotally, we know that people don’t get burned with this much H2O2 in the water. If H2O2 levels fall to 0 then you may end up needing to shock your water, so keeping levels up is important. The reason to shoot for a range on the higher end of the minimum to max is to prevent your tanks is to be more certain your levels will not reach zero. This isn’t an official recommendation, just what we have found to be most effective. Might you be able to provide guidance (ideally the step by step process) for how to properly go about “shocking” the tank when/if you find that your H2O2 levels have dropped too low? How much H2O2 is needed? Unintended consequences of adding to much?